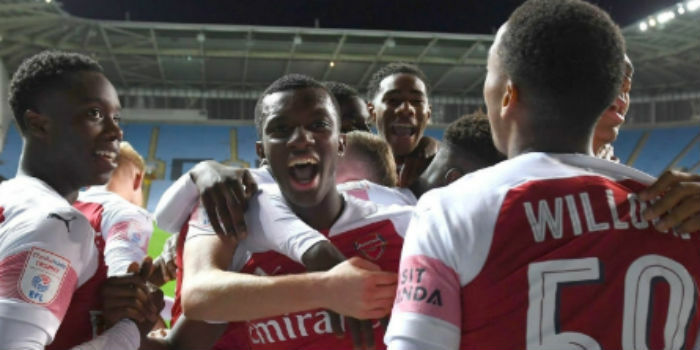 Arsenal under-21s kicked off their Checkatrade Trophy campaign with a 3-0 win over League One side Coventry City at the Ricoh Arena. Freddie Ljungberg’s youngsters got off to the perfect start when 18-year-old Emile Rowe Smith, who made such an impact on the first team’s pre-season tour of Singapore, opened the scoring on four minutes. Eddie Nketiah took advantage of a defensive mix-up to double Arsenal’s lead with 12 minutes remaining and Joe Willock rounded off the scoring late on. The Checkatrade Trophy features all League One and League Two clubs, as well as 16 Premier League and Championship ‘B’ teams. The Gunners will next travel to Cheltenham Town on 30 October before rounding off their group stage fixtures with a trip to Forest Green Rovers on 7 November. Arsenal XI: Dejan Iliev (GK), Tolaji Bola, Julio Pleguezuelo (C) (88’), Zech Medley, Joseph Olowu (45’), Charlie Gilmour, Joe Willock, James Olayinka, Robbie Burton (72’), Emile Smith-Rowe, Tyreece John-Jules. Subs: Arthur Okonwo (GK), Tobi Omole (45’), Dominic Thompson, Trae Coyle, Gedion Zelalem, Bukayo Saka (87’), Eddie Nketiah (72’). Why did Eddie not start? Thats a question for Ljungberg. Sometimes i just wish our u23 team can be converted to our first team..i wish Emery can just take charge of our u23 and use them as our first team.. Let him grow with them.. I’m so willing to be patient to reap the fruits… Those boys play better football than our first team right now to be honest….and that guy called Emile smith Rowe is a gem..he is the new arsenal Ronaldo or Messi that’s gonna take arsenal to another level just the way they did it for Real Madrid and Barcelona….we need to start making Emile smith Rowe feel important in our first team.. He is a future world best in the making..no doubt about that as long as he fulfils his potential….my gosh.. I’m so happy to have Emile smith Rowenaldo and Nketiah… Let the future come!! Good to see Zelalem back in the squad. Still got hopes for him. I never understood why in “Under” 21 are allwoed also 21 year olds (like Gedion). Call it “Under 22” then..
I’m sure the rules of u21 football allow for a certain number of overage players. This is an outdated rule really, it’s in place to allow clubs to ease in injured seniors or out or sorts stars. Now there is a focus on improving competitiveness at youth levels, it seems a little unfair on those looking for starting places. Does anyone know if Arsenalplayer will put highlight packages of these together? Sometime tomorrow coventry will post extended highlights on ther website. You just have to make a free account. Hey, thanks for that – much appreciated! Goals from our most highly rated young players, that’s encouraging. I would like to see the highlights so that I can analyse Charlie Gilmour. He might not be spoken about as highly as the rest, but he has been really good everytime I have seen him play. Good stuff. Was anyone there at all? From that photo the stadium looks empty. Thought part of the concept of having young Premier League sides was to provide a little bit of a draw for fans. 1 being that it’s such a nonsense competition and another being that there’s been a blanket boycott from some fanbases. Coventry having a recent history of such behaviour. Cheltenham is a good night out , so hopefully a few more will make the trip. Full house at FGR we should hope. Around 2,500 in attendance. Apparently. That includes 183 Gooners, including Mr Tony Adams sitting amongst the faithful! I guess for stewarding they kept the crowd in just one stand, and us gooners in a little section behind the goal. Twould be nice, for the sake of the game – to have the opposition lineups in there as well. I know it’s a bit of extra effort, but I feel like efforts have to be made to fight this idea that only the Premier League/”us” matter, and the rest are nameless, faceless, fodder. Symptomatic of larger, broader problems in the world. This a game of Call my Bluff? I expected a lot more from zelalem since joining us. Had a good spell at Rangers. Hope he gets back to his best very good player.